Throughout much of the world, night skies are growing increasingly brighter, but the force that protects the remaining naturally dark sky, unpolluted by artificial light, is the same that saves its ancient trees--isolation. Staking out some of the world's last dark places, photographer Beth Moon uses a digital camera to reveal constellations, nebulae, and the Milky Way, in rich hues that are often too faint to be seen by the naked eye. 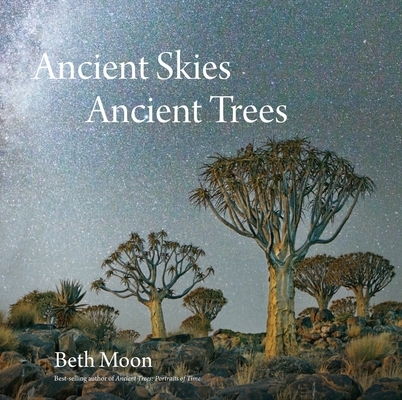 As in her acclaimed first volume, Ancient Trees: Portraits of Time, these magnificent images encounter great arboreal specimens, including baobabs, olive trees, and redwoods, in such places as South Africa, England, and California. In her artist's statement, Beth Moon describes the experience of shooting at night in these remote places. An essay by Jana Grcevich, postdoctoral fellow of astrophysics at the American Museum of Natural History, provides the perspective of a scientist racing to study the stars in a world growing increasingly brighter. Clark Strand, the author of Waking Up to the Dark: Ancient Wisdom for a Sleepless Age, takes a different tack, illuminating the inherent spirituality of trees. Beth Moon is a photographer based in New York who has gained international recognition for her large-scale, richly toned platinum prints. Her prints are held in numerous public and private collections and have appeared in more than sixty solo and group exhibitions in the United States, Italy, England, France, Israel, Brazil, Dubai, Singapore, and Canada, receiving widespread critical acclaim. With this new book, she explores color photography for the first time. Clark Strand is an American author and lecturer on spirituality and religion. He is the first Senior Editor of Tricycle: The Buddhist Review, and the founder of Way of the Rose, a nonsectarian rosary fellowship with members around the world. His recent works are Waking Up to the Dark: Ancient Wisdom for a Sleepless Age (2015) and Waking the Buddha (2014). Jana Grcevich is a Kathryn W. Davis postdoctoral fellow in astrophysics at the American Museum of Natural History. Her research focuses on dwarf galaxies and gas in space. She also works with Guerilla Science's Intergalactic Travel Bureau, which blends science and performance art to plan participants' space vacations.